I had a lovely day thank you, so nice to go to London and get out of the house! 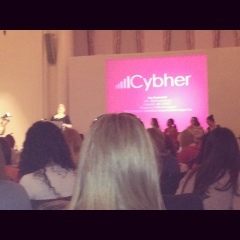 I'm so jealous of all the Cybher pics already! Hope you had a great day. Thank you! Need to check out some other posts about it! I did, a completely new experience for me but very worth while. Yay! I was there too - so tired now though! Hope you had a fab time! Yeah, I wonder if there is a linky somewhere? I am so jealous, really wanted to be there but this year has been full of uncertainties so far. Hope there is one next year! I hope so too, there is always Britmums? OOh I'm really looking forward to reading all about Cybher. Hope you had a great time! another time I really want to go too, I wish London was a little closer for a day! Hi Gemma - I did get talking to quite a few people but like you I found it hard. I'm not really used to networking etc. I saw you outside with your friend taking your pic and thought you must be a professional fashion blogger!